I’m a sucker for a statement necklace. Whether it’s covered in bedazzling jewels or made from lengths of multicoloured rope, I’m going to be all over it. Especially if it’s one that not everyone has. I’m attracted to slightly unusual pieces the way a Magpie is attracted to silver. If it’s out there, goddammit, I’m going to hunt it down. And Etsy is always a good place to start. 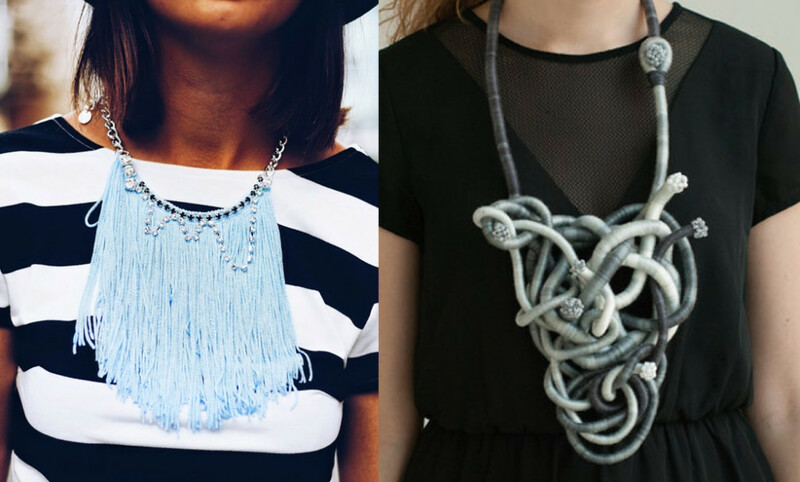 Here I’ve found the 5 best statement necklaces on Etsy. Check ’em out. I am a lover of all things covered in fringing, so a necklace dedicated to it completely floats my boat. I already own one in a darker blue and can already imagine wearing them both at the same time. I could go fringe-tastic. Green ombre, braided, hand sculpted out of clay and on an antique bronze plate. Sold. I love me some oversize jewellery, and this necklace is definitely that. The rope intertwines in grey ombre and is adorned with hand-sewn seed beads. It’s a head turner. I chose this beauty because it reminded me of a peacock. The mix of blues and purples with the beads and gems is magical. As is the intricate way it’s been made. Gorgeous hand-cut rings of patent leather looped next to gold-colour aluminium. Ready to vamp up a basic tee and jeans combo. Which one most takes your fancy?